No, I’m not talking about our new Presidential leadership. While I have increasingly more to say about that every hour of every day (who doesn’t?! ), that’s a conversation for another time. By ‘new normal’, I’m referencing how I felt hiking Mt Kilimanjaro a few weeks ago. I find myself thinking about the culture I experienced in East Africa, the hike itself, watching nature’s animals co-exist during the three-day safari, and the amazing humans I was fortunate to cross paths with. I’m still distilling these experiences from the 13-day adventure, and aim to write more about it in the coming weeks. The idea of ‘a new normal’ has been the most present thought consuming my mind, and while I’ve struggled to articulate my thoughts in any coherent manner, I hope this version makes sense. I planned this trip as a reward to myself. The day I submitted my application for grad school, I started a savings account specifically for this trip. I told myself that IF I got accepted to grad school and IF I successfully finished the courses, I would treat myself to this adventure and cross off one of my bucket-list dreams. All of those ‘if’s’ actually did happen, and when planning the timing of this trip, a few more milestones coincided to make this a very a meaningful journey. With this planning, I stepped on the plane on January 5th with a mindset of reflection - of challenges, of achievements, of exploration, and of life. Upon landing at Kilimanjaro airport, my prior perception of this climbing adventure paled in comparison to the visible reality of the mountainous challenge. I was excited, overwhelmed with the landscape’s beauty, sweltering in the heat, and the first of many, many doubts started passing through my brain. Little did I know that the psychological challenges yet to appear throughout the hike were magnified unlike anything I had experienced. The second doubt was only a few hours later, when I almost passed out at the hotel (I think due to mixing a cocktail of altitude meds, malaria meds, and DayQuil with not enough food). The third doubt was only two hours after that, at the initial hike meeting. By this time, I had a healthy dose of fear that led to a severe internal struggles about whether I should even set out on the hike. Was I well enough to actually do this? Had I trained enough? (NO, thanks to the tendonitis in my foot.) Would the lack of training hurt me? What would happen if I hurt my foot further? How would I get off the mountain? Did I pack the right things? (YES, I again overpacked.) What am I not thinking of that I should be and/or should have prepared for? After sleeping for a few hours (the others were spent laying wide awake in bed, anticipating the alarm), I decided to set out with my hiking group and see as much of Kili as possible. After less than an hour, I quickly realized two things: (1) my pack was too heavy, and (2) I had no idea what I was in for. I’m of the mindset that luck favors the prepared, though I wish someday I will finally live my belief that I can more than comfortably manage on less things. I’ve increasingly tried to live that way over the past year, though that lesson completely vacated my mind when I was filling my hiking packs. Embarking on this hike was similar to my intro into running marathons. Before setting out for the Boston Marathon, I had only run a 10K. I had trained for a half marathon (though didn’t run it due to my Grandma’s funeral), then continued the training just beyond 17 miles. The day of the marathon, each step and each mile was one step / mile further than I had previously run, and adrenaline carried me to the 26.2 mile finish line. (I have since changed my training habits...) Similarly, I have hiked a variety of mountains throughout the Northeast the past few years. Yet I hadn’t slept in a tent. I hadn’t carried so many supplies on my back. I hadn’t done multiple-day hikes. I hadn’t hiked in five climate zones period, let alone five climate zones in one week. Yet somehow, I again jumped in feet first with my eyes closed, anticipating a grand and memorable adventure. I was struggling after only an hour hiking on Kili. I was at the back of our hiking group, sweating from the humidity and the weight of my pack, and already could feel the decrease in oxygen impacting my breathing and energy levels. Again, I was having a tremendous internal debate about my ability to complete this challenge. As silly as it sounds, somewhere along the route I started a mantra in my head. With each step I took, I said one word of the phrase “you can do this.” I have no idea how long I kept this up for, but breathed a huge sigh of relief when approaching our first campsite after five-ish hours of hiking. One gift that I am grateful for is the ability to fall asleep nearly anywhere. The newness of the tent that first night? No problem. I was protected, covered, warm in my sleeping bag, and within minutes was out cold for a solid eight hours. I woke refreshed and energized the next morning, thinking to myself - this trip is setting up a ‘new normal’ for my life, at least for the following five days. The new normal was seemingly simple - expect the unexpected. I had said these words before, yet understood a completely new meaning. Truly - I could not begin to imagine, let alone expect or anticipate, any single thing that would be happening in the coming days. I had to accept that, and be willing to embrace the newness of each and every step. With that mindset, I found a release. I relaxed into the hike, finding myself enjoying each moment. I was able to take in my surroundings, listen to the sounds of nature and learn stories of life lessons and experiences from my fellow hikers. I deliberately didn’t wear a watch on this trip, and on this second day fully appreciated letting go of time. I had no expectations of how far we were to go, nor anticipations of how long it would take to get where we were going. (Well, with any luck, I was expecting a shower on my birthday, Friday the 13th) As of our second day, I firmly believed that my only expectation was to expect the unexpected. Living by this new normal was a gift. Each day of the hike seemed enjoyably long and fulfilled, followed by a restful and peaceful sleep each evening. On our summit night, January 12th, we were woken at 11PM; breakfast was served at 11:30PM, and we set out for the roof of Africa at midnight under the light of the full moon. The stars were twinkling, Venus was shining brightly, and these were the hours I had dreamt of for so long … yet again doubt crept in. I struggled with breathing tremendously. Being a wind musician, I understand what taking a deep breath does for the body. I couldn’t catch my breath, and felt like I wanted to lay on the rocky lava sands to take a nap. For at least the first two hours of the hike that night, I fought with myself about whether to continue or whether to turn back and go down to camp. After a short break, I finally ended the intense internal argument by telling myself (excuse the language) - “What else are you f*cking going to do tonight?! You can sleep when you’re dead. Hike as far as you can, one step at a time. Remember your new normal.” Again, I found a release from believing in this new normal. I didn’t fight the challenge, but rather embraced it. This experience was something to learn from. Something to always remember. Something to cherish. I took baby steps up the mountain. I counted 50 steps, rested my head on my trekking poles to count 10 breaths, then repeated this over and over and over and over. At sunrise, my guide Edie and I were about 90 minutes from the summit point. We stopped for a mug of hot tea (that was a lovely surprise he had hidden in his pack!) and a homemade granola bar, just long enough to watch the most beautiful sight of the sun rise through a crystal clear sky. Kenya was on our left, Tanzania on the right, and Mawenzi’s peak was (at that point) below our gaze. The journey continued. 50 steps and 10 breaths. 50 steps and 10 breaths. Before I realized it, I had summited Kilimanjaro at Gilman’s Point. Even now as I’m typing this, I’m emotional just remembering my own emotions that day, as well as the feeling of accomplishment standing at that particular point in this world. Throughout the climb and every day after, I have marveled at trying to comprehend how and why we set limits for ourselves. Sure, some limits in life are truly real. Yet so many limits in our lives are fabricated (at least in part) in our own minds. I knew this hike would be hard … yet I had absolutely NO concept of just how difficult this challenge would be. Sure, physically it was taxing on my body - sore muscles; a few blisters; sun-burned nose, lips, and hands; temporarily swollen feet / legs; and 3 toenails soon to fall off; but overall, our bodies are miracles and can survive tremendous challenges. Tears of relief and excitement, when I made it to the the roof of Africa. Tears of gratefulness for the team of amazing individuals that safely guided us on this trek. Tears of genuine surprise and appreciation for my new hiking friends, greeting me at the park exit gate while singing happy birthday at the top of their lungs. Tears from being completely humbled by this mountain, helping me to understand myself in a way I didn’t believe was possible. Mentally, I was pushed beyond limits I didn’t know I held. The power of our internal voice can truly make or break one’s confidence and ability to succeed. I fought this intensely, especially at the beginning and end of this journey. Only when I truly believed in my new normal - to only expect the unexpected - was I able to let go of the limits and fears that held me. Letting go empowered me to trust myself to achieve what I had set out to accomplish. This was, hands down, the hardest challenge I have ever faced in my life. I have never been more proud to have made this journey. Our head guide, Makeke ... a truly amazing guide who led us to our summer. 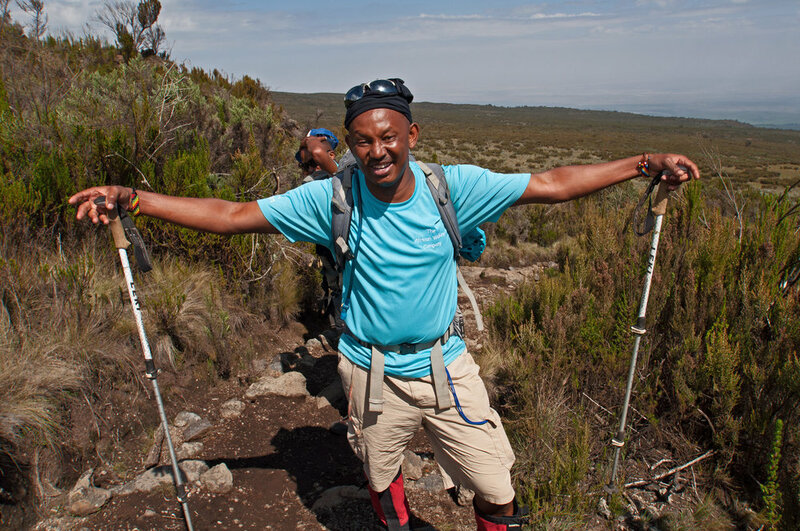 He is caring, good-humored, and humble - we couldn't have asked for a better guide (and team!) to take us on this journey. Somewhere along the journey, on one of our many breaks. Another hiking break ... the views every step of the way were breathtaking. We were getting higher and higher, and the sun was much more intense ... it's unfortunate that I forgot to apply sunscreen on the top of my hands! Another perspective ... getting closer to the summit, one step at a time. Sunrise on January 12, 2017. Kenya on the left, Tanzania on the right, Mawenzi in the middle. My summit guide, Edie. He carried my pack most of the way on summit night, sat with me for a rest to share tea and homemade granola bars to watch the sun rise, and inspired me to finish what I set out to do. What a gentle and supportive individual that I will always be grateful to have known and climbed with! I made it to THE ROOF OF AFRICA!!!! With my dear friend Emily at the Kilimanjaro Park exit gate ... on my birthday. We made it, despite our toenails protesting otherwise. A final perspective from the airplane headed home. Kili on the left, Mawenzi standing tall on the right. I was in tears looking at this, in disbelief of what I had accomplished.